Anyway I intend to do data files for all pilli adventure monters (probably I´ll upload them in the blog instead of the comic archive). I already have the storyboards(a very bad drawn script) for the next arc (a 12 page saga) but july Im going to vacation and I dont want to interrupt it. monster level 2.- tricky monsters (the chaneque, Chapad pot) play pranks and jokes on people they usually dont hurt people. 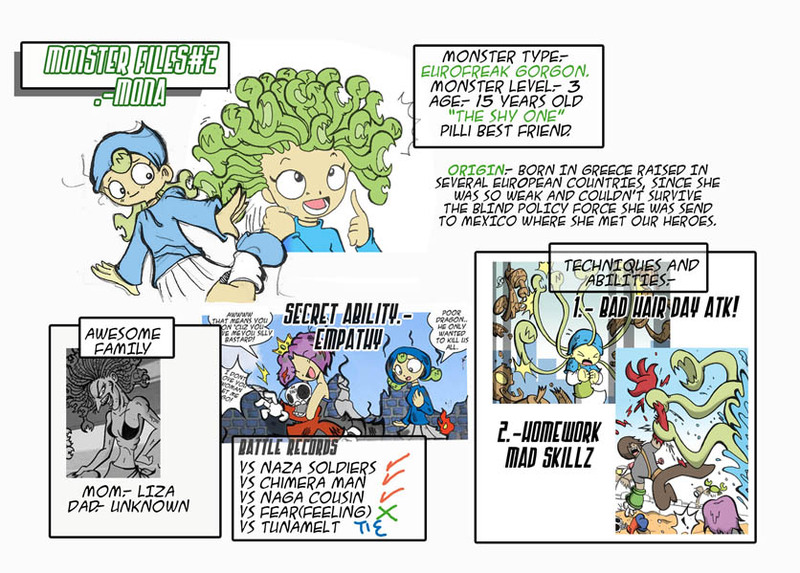 monster level 4.- very strong monsters with high IQ (Coa,witches) they are country level danger. This entry was posted on Wednesday, June 23rd, 2010 at 2:54 pm and is filed under Uncategorized. You can follow any responses to this entry through the RSS 2.0 feed. You can leave a response, or trackback from your own site. Mona put up a tough fight, but in the end, it seems she and the tuna melt were too equally matched. Keep training Mona, and you’ll defeat that sandwich yet. Dang! If Mona can’t beat a Tunamelt in a fight, what hope do we have when the Lasagna comes to conquer us?! I loled like crazy with this one also I think I’m the only who got the tunamelt joke. You post great posts. Bookmarked for future referrence !